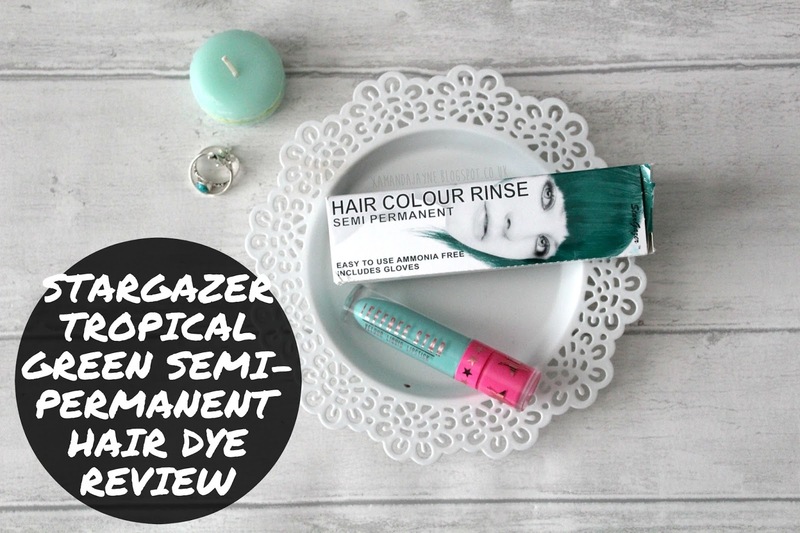 The Stargazer Semi-Permanent line of hair dyes can be found on various places across the internet. Amazon sell them, as well as individual websites, and, of course the Stargazer website itself. They have a massive range of colours, all being very vivid and exciting, and are a purse-friendly price of £5 each. Sometimes you can find sellers that sell for a little less, but I'm happy to pay the £5 as that still isn't expensive for hair dye, especially hair dye that is of Stargazer's quality. They are notorious for their hair dyes and it's definitely with good reason! The tube itself containing the dye is just short of being as big as the box itself, so it is quite a small and compact bottle. Certainly, one bottle wouldn't cover your entire head if it was the same length and texture/thickness as mine, but I only needed one bottle to dip-dye which was very surprising as, to be on the safe side, I bought two! Whilst the boxes look like two different shades, I can assure you they turn out exactly the same colour - for the following photos, I used the bottle that was in the lighter, brighter packaging and the colour on my hair is exactly how it looks on the other, darker box, if you get what I'm saying! I was really surprised at how well this turned out. Obviously, it clung to my blonder sections of hair a lot better than it did my darker, underneath hair, but that was to be expected as it's often the same with any dye I apply. As a result, it is less vivid on the darker hair. I was worried it would come out a little brighter than this, as the Ultra Brights line come out so vivid on my natural hair, but thankfully it came out exaclty as I wanted it to - this dark, teal-toned tropical green. The photo above was taken when I was filming a Collective Haul video back in March, and here I hadn't washed my hair except to rinse out the dye initially. I don't lighten or bleach my hair before dying it, so I'm pleased that this resulted in being as vivid as it turned out. The instructions are quite vague when it comes to how long you should leave it on for, as it says 15-30 minutes, whereas the Ultra Brights come with specific instructions in a separate leaflet (Stargazer print the instructions onto the box, both inside and outside), which cater to whether you are dip-dying, using it for all-over colour, etc. 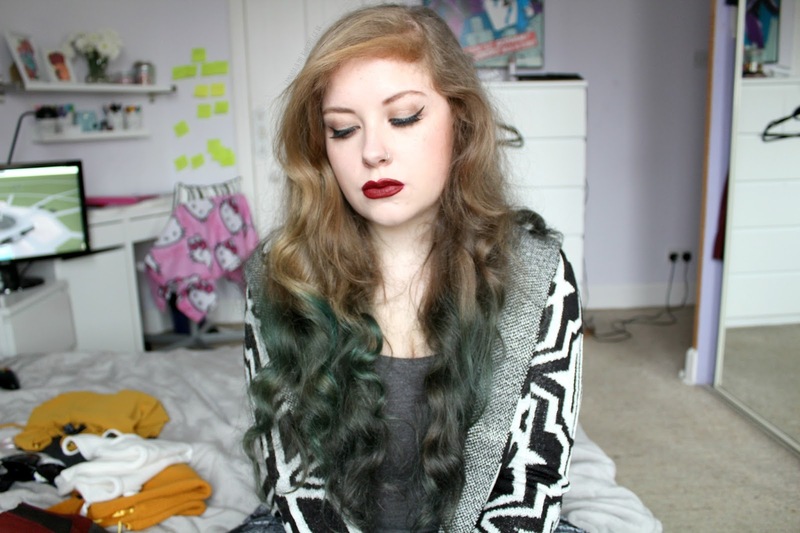 I left my Tropical Green dye on for about thirty minutes which seems for my hair to be just right. In the photo above, I had washed my hair about four times since the initial rinsing-the-dye-out process, and the colour is still clinging on well. When I washed my hair, the most recent three times I found absolutely no colour running down the drain which is really impressive. The Ultra Brights line runs for quite a few washes after I've dyed it! I know this picture isn't the clearest because of how close I am to the camera, but it's worth noting that on the right there my hair isn't grey or muddy coloured, it's still green, just a rather dark green because as I mentioned before, the dye didn't take as well to the darkest areas of my hair! And, finally, here we are at about ten washes. As you can see, all the vividness of the colour is completely gone and it's a washed out, drained version of itself. It's more of a murky green-grey at this point! Still, I feel like I got a good run out of this. While I love my Schwarzkopf, the bright colour is gone in a matter of weeks, where as with this I got about a month and a bit out of it! By mid-May the colour was pretty much gone! I love this colour, and I want to remain being this colour for a while. I like how it's bright, but it isn't as in your face as my beloved Ultra Brights, so it makes a nice change of pace. I'm going to continue using this for a while and repurchasing, and next on my list is to maybe try Directions hair dye which I've heard good things about. I'd also like to try a cobalt, and I'm thinking of the Ultra Brights one for that! And I want to go pink at some point... Hahaha. But for the time being, I'm happy to stick with Tropical Green! What do you guys think of Stargazer hair dyes? What brightly coloured dye brands do you recommend? Let me know in the comments!